The July 2018 lunar eclipse is a rare central lunar eclipse, where part of the Moon passes through the center of the Earth’s shadow. It is also the longest total lunar eclipse this century, lasting 1 hour and 23 minutes. This powerful total lunar eclipse is also called a blood moon because of the reddish color caused by light being refracted by Earth’s atmosphere. 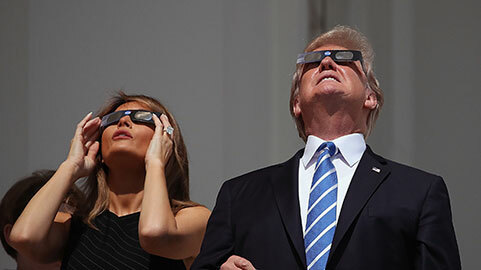 Even President Trump took time out with wife Melania to view the Great American Eclipse of 2017. Now consider the many twists and turns of his presidency since that very day. Not that there was not an ongoing soft coup launched against him before that fateful day in August, but Trump’s life has certainly seen many extreme difficulties since that defining moment. 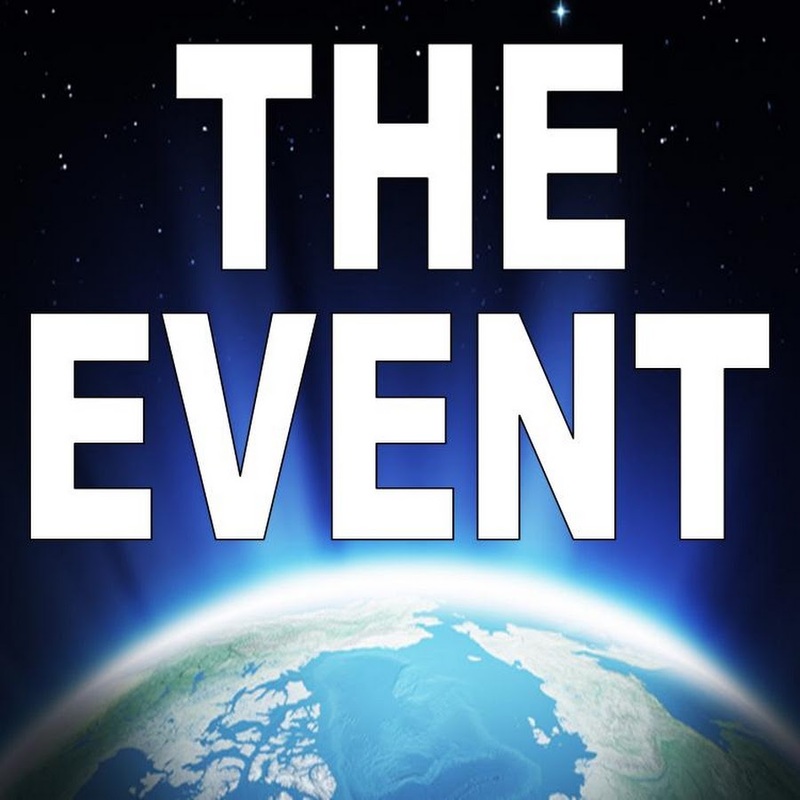 The EVENT is not a single happening. It’s actually a series of unparalleled events that will unfold as dominoes falling against each other. When each domino falls, the subsequent affects on the global village will increase markedly and be felt accordingly. From this year onward, humankind can expect a sudden quickening. Not only will time seem to be moving considerably faster than it already is, time warps and time compression will occur much more frequently. Many will feel as though something truly awesome and climactic is about to occur. Since the turn of the millennium there has been a substantial uptick in supernatural and mysterious phenomena. There has been a series of perceptible changes which point directly to a planet in great flux. Even the solar system has experienced profound and fundamental changes that astronomers marvel over but don’t talk about. The residents of this planet now know that humanity stands at the cusp of something quite HUGE. This palpable sense of an evolving planetary metamorphosis has captured the imagination of every inhabitant of Earth. Each one sees and experiences this unprecedented transformation in a different way as the collective anticipation and awe are inspiring the slow-motion creation of a new civilization. Only the EVENT can adequately prepare the planet for such a needed outcome. Each and every eclipse — both solar and lunar — further prepares the global and individual consciousness for what is about to soon take place. Very few souls will ever heed this advice because they simply don’t know what they don’t know. Then, of course, we all know the people who think they know everything. They will emphasize that modern science has freed humanity from the ancient superstitions associated with solar and lunar eclipses. And, that having prudent respect for such an impactive astronomical appearance is nothing but childishness. That is until their life crashes and burns in the immediate aftermath of an extraordinary eclipse like tomorrow’s. Where this lunar eclipse can’t be seen and where it will be fully visible is highly significant. The map above delineates exactly where this eclipse can be viewed. It’s quite telling that virtually no where in North America can it be seen. Conversely, this lunar eclipse can be watched with full visibility throughout the entire Middle East. The actual geographic area of full visibility represents the region of the world where so many dramas have occurred over the millennia. It’s as though something major will be uncovered there in 2018. History buffs know that this region is also known for The Great Game. Far from being a game, The Great Game represents a multi-century attempt by the British Empire to gain complete control of Asia. Not only do the Brits still seek to stealthily conquer these lands, they ultimately seek full control of Russia. Hence, Russiagate was fabricated as a fake pretext to incite Russophobia worldwide. However, this surreptitious plot has backfired in ways that even the Brits could never have imagined. However, it’s really Iran that is now at the center of this “earthly drama and heavenly play“. The remainder of 2018 is likely to see an unexpected transformation in the relationship of that nation to the rest of the world. Seen as an international pariah by the West, that vision will no longer hold. The world community of nations will look to Iran for its courage and perseverance in staving off incessant attacks by the Anglo-American Axis. They will come to the aid of Iran like never before and Tehran in dealing with so many acts of financial terrorism and economic sabotage inflicted by the United States, United Kingdom and Israel. Immediately following the Great American Eclipse of 2017 many people rejoiced because there were no apparent negative impacts on the USA. However, that’s not the way eclipse energy really works. The week before and after an eclipse can be greatly affected depending on many factors that are well beyond the scope of this article. Similarly, the three weeks before and after will also often see various consequences. When those monumental calamities are considered in the aggregate, as well as those that occurred throughout the Fall of 2017, The Great American Eclipse will likely be considered the most consequential of the millennium. Because only North America is largely left in the dark during this eclipse, there is surely a cosmic message in the offing. Perhaps the pervasive lack of awareness that so many Americans have about the highly destructive Great Game will bust out into the open. In this manner, a concealed truth which has affected the American people so deeply may be brought out into the open, once and for all. Then, We the People will not be so quick to support and/or ignore so many unprovoked wars of naked aggression waged in foreign lands by the U.S. Military. That would be a good thing, yes? A very good outcome indeed! Hopefully, this exceptional eclipse will hit that mark. 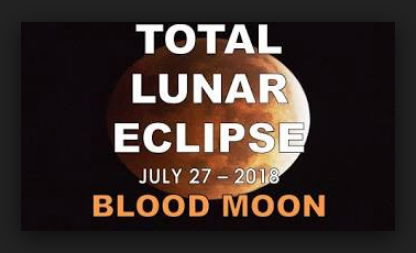 While the admonition not to watch this specific lunar eclipse has been issued primarily for our readers who are not located in North America, it’s also meant for our local audience. Live-streaming this eclipse is almost like watching it in person, so not recommended at all. Furthermore, there are typically 4 to 5 eclipses every year that also need to be responded to in the most appropriate manner.